Our coconut coir products are the best quality and used buy our customers around the globe. We put special attention to the quality of our products. Our stringent process ensures optimal physical and chemical properties of final products. Coconut coir growing medium comes from the coconut's fibrous husk (known as coir) that is bound together by lignin (known as pith). After the husk is immersed in water for 6 weeks, the fiber is extracted mechanically, and the pith is left behind as a waste product and stored in heaps to age. Since the pith comes from the fruit, it is quite naturally rich in nutrients. Coconut coir growing mediums are dehydrated and compressed into a compact form for easy handling. With the addition of water, coir expands to an easy to work with growing medium. The addition of water increases the volume 3 to 9 times, depending on the packaging of products. This process results in a 100% organic, biodegradable growing medium, making it a natural and safe growth medium of choice for growers. Coco peat is a premium growing medium and superior alternative to peat moss. Coir is the coarse fibers and sponge like pith material that make up the thick husk of the coconut fruit. 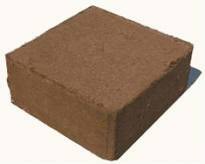 Cosmic Coir 5 Kg block/ compressed 5 Kg coco peat block is our best selling product. It is most commonly and widely used bulk product and very cost effective. Cosmic coir compressed 5 kg block can be used in almost any situation like in commercial potting mixes, home gardens and growers, greenhouses etc. Our coco coir products are organic, guaranteed to be very high quality and very low salt content. Very low level of EC is attained by repeated washing with fresh water. Cosmic coir peat is a premier growing medium and is an excellent alternative to peat moss. Our coco peat is free from dirt, foreign material and weed seeds. We screen our washed raw material to remove dirt and bigger chunks to get perfect texture. Applications include hydroponics, commercial potting soil mixed, direct soil amendment, compost amendment, animal/livestock bedding, reptile bedding, liquid absorbing compound. When using coco peat as growing medium, we highly recommend buffering of coco peat products. The buffering process involves pre-soaking the coir for 12-24 hours with a buffering solution high in calcium; this displaces the sodium and balances the naturally occurring potassium. After the soaking period the media is washed with water, this removes the displaced sodium, leaving the calcium in the coir. This buffering process prevents unwanted draw down or ‘lockout’ of calcium and magnesium, and avoids sodium toxicity issues. Directions for Use: Lay block down flat somewhere with good drainage. Slowly pour warm water over block allowing water to absorb without runoff. Let it sit for 30-40 minutes. Break apart with hands until light and spongy. Warmer the water, faster and easier is the expansion. Do not use hot water over 100 deg. Compressed 5 kg block will yield approximately 2.5 CF with 8-10 gallons of water. Cosmic Coir loose coco/uncompressed coco peat is wonderful product. A truly exceptional ready-to-use coco peat based potting soil. We use coco peat which is exceptionally low in salt (after repeated washing with fresh water) to make this hydroponic soilless medium. Cosmic coir coco peat based hydroponic soilless media is engineered to allow gardeners to feed heavier for greater yields. Works great in hydroponic applications and container gardening. Using coco peat helps farmers economically in developing countries like India and Sri Lanka. Coco peat is being integrated into agriculture all around the world. 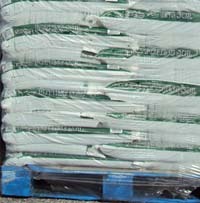 Our coco peat briquettes are 100% natural organic growing medium which gives a higher volume and is in compressed form. This one liter block can be expanded up to 8 liters by adding 2 liters water. Cosmic Coir 650 gram briquette/compressed coco peat briquette 650 gram is very easy to handle size and popular among the home gardeners. 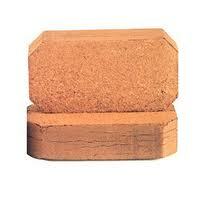 Briquette is the ideal and handy retail pack for home gardening, horticulture, hanging baskets, troughs etc. where we do no need larger expanded volume. This can be used on farms, greenhouses, horticulture, hydro seed spray, landscape and as a substitute for potting soil. Our coco coir products are organic, guaranteed to be very high quality and very low salt content. Very low level of EC is attained by repeated washing with fresh water. 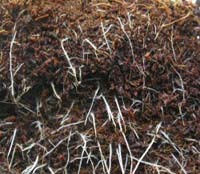 Cosmic coir peat is a premier growing medium and is an excellent alternative to peat moss. Our coco peat is free from dirt, foreign material and weed seeds. We screen our washed raw material to remove dirt and bigger chunks to get perfect texture. Applications include hydroponics, commercial potting soil mixed, direct soil amendment, compost amendment, animal/livestock bedding, reptile bedding, liquid absorbing compound. Cosmic coir discs are made of our same excellent quality coir peat. These coco discs are great for filling small pots at home or in commercial use. Also can be custom made to fit into retail “all-in-one” flower packing. Coco peat discs are ideal products for planting seeds and seedlings. Size, Packaging, Quality can be customized according to customer request. Directions for Use: Lay disc down flat somewhere with good drainage. Slowly pour warm water over disc allowing water to absorb without runoff. Let disc sit for 30-40 minutes. Break apart with hands until light and spongy. Warmer the water, the faster and easier is the expansion. Do not use hot water over 100 deg. Discs can also be put in pot and add desired quantity of water. Our coco peat grow bags are used as plant substrates for soil less cultivation, largely used in greenhouses for growing vegetables: tomatoes, pepper, cucumber, strawberries, cut flower production. We are able to meet customer’s specific needs in dimensions, expanded volume, as well as physical structure of the product to ensure required water and air holding capacities, part distribution etc. Raw materials for Grow Bags require special selection and processing methods. First, fresh coir pith is allowed to mature 2-3 years; this natural process of exposure to constant monsoon rains reduces salt, phenol and tannin. Matured coir pith is then processed to remove fine particles and long fibers. Next, it is washed to reduce salinity to optimal levels and sun-dried on concrete. 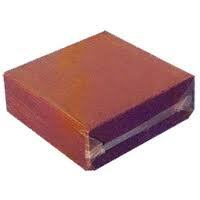 This coir pith is compressed into slabs of various dimensions and sealed in UV stabilized poly bags. Finally, the bags are tested for expansion, EC and pH, and then shipped. Cosmic Coir Grow Bags are rapidly becoming a popular choice for hydroponic cultivation of hot house tomatoes, cucumbers, strawberries and peppers. Plants root faster and develop stronger root systems resulting in superior vigor and yield. The quick growth of a strong root system also helps prevent Pithium infection. If infection occurs, the success rate of recovery is significantly better than Rockwool. Packing Palletized and shrink wrapped. Coconut husk hold moisture up to 7 times is weight, is durable and is a stable carbon source. Coir husk chips are produced by cutting dry coconut husks in to small cube shaped pieces. Coir husk chips can be added to coir peat to increase the air porosity and water holding capacity. It also has excellent drainage and nutrient holding capacity and its fungi resistant. Coir husk chips are proven as excellent medium for growing plants like orchids and in hydroponics, soil less medium growing, mulch and ground covering etc. Coco husk’s characteristics like excellent drainage and nutrient-holding capacity helps the healthy growth of plants. These absorb up to 10 times their weight in water and retain moisture. These coconut husks are the outer layer of the coconut fruit, which consists of long fibers and sponge-like pith particles. With diminishing sources of quality tree bark, these are a superior alternative to bark based growing medium.